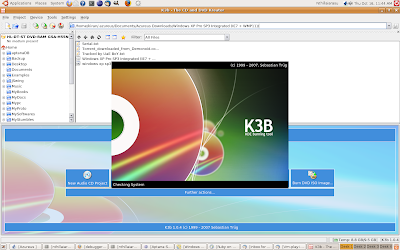 i have been using ubuntu for couple of years.For writing the datas i will be using Gnome Baker.Now i have started using K3b.K3b is a good and easy to handle CD burning application. o Add files and folders to your data cd project via drag'n'drop. o Remove files from your project, move files within your project. o Create empty direcories within your project. o Write data cds on-the-fly directly without an image file or with image file. It's also possible to just create the image file and write it to cd later. o Rockridge and Joliet support. o Rename files in your project. o Let K3b rename all the mp3/ogg files you add to your project to a common format like "artist - title.mp3". o For advanced users: support for nearly all the mkisofs options. o Verifying the burned data. o Support for multible El-Torito boot images. o Pluggable audio decoding. Plugins for WAV, MP3, FLAC, and Ogg Vorbis are included. o CD-TEXT support. Will automagically be filled in from tags in audio files. o Write audio cds on-the-fly without decoding audio files to wav before. o Normalize volume levels before writing. o Cut audio tracks at the beginning and the end. o CD-Extra (CD-Plus, Enhanced Audio CD) support. o All data and audio project features. o CDDB support via http, cddbp and local cddb directory. o Sophisticated pattern system to automatically organize the ripped tracks in directories and name them according to album, title, artist, and track number. o CD-TEXT reading. May be used instead of CDDB info. o K3b stores CDDB info of the ripped tracks which will automatically be used as CD-TEXT when adding the ripped files to an audio project. o Plugin system to allow encoding to virtually every audio format. Plugins to encode to Ogg Vorbis, Mp3, FLAC, and all formats supported by SoX included. * Retrieving Table of contents and cdr information. * Writing existing iso images to CD or DVD with optional verification of the written data. o Detection of max. writing and reading speed. o Detection of Burnfree and Justlink support.